Henry Christian "Hank" Foldberg, Sr.
Foldberg was an American college and professional football player who became a college football coach. Foldberg played college football for Texas A&M University and the U.S. Military Academy, and thereafter, he played professionally for the Chicago Hornets and Brooklyn Dodgers of the All-America Football Conference (AAFC). He later served as the head football coach of Wichita State University and Texas A&M University. Foldberg was an American military officer and football player. He played as an end for the Army Cadets at the United States Military Academy. Army head coach Earl Blaik rated him the best end he had ever coached. He was selected in the 1951 NFL Draft, but pursued a 27-year military career. Foldberg served as an infantry officer in the Korean and Vietnam Wars. Mays was a football player who starred for Southern Methodist University before becoming a standout at the professional level for the Kansas City Chiefs. The former defensive lineman earned all-Southwest Conference honors at Southern Methodist before joining the American Football League's Dallas Texans in 1961. 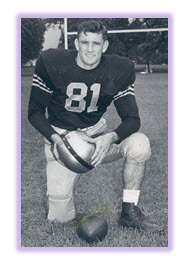 He played in the Texans' 20-17 double-overtime victory over Houston in the 1962 A.F.L. title game and remained with the franchise in Kansas City from 1963 to 1970. Rhome is a former American football quarterback in the National Football League. He played for the Dallas Cowboys (1965–1968), the Cleveland Browns (1969), the Houston Oilers (1970), and the Los Angeles Rams (1971). He closed out his playing career in 1972 with the Canadian Football League Montreal Alouettes. Runner-up, 1964 Heisman Trophy at Tulsa; College Football Hall of Fame; Coach, Super Bowl XXII Champion Washington Redskins; Sanger Trophy Honoree.